I went to the grocery store, picked out four random ingredients, and resolved to make something out of them, just like in friggin Chopped. But alas, I have zero originality so I ended up transforming none of the ingredients, and just threw them on a pizza like I do with all the other food I buy. The result was blog-worthy though, so here it is. 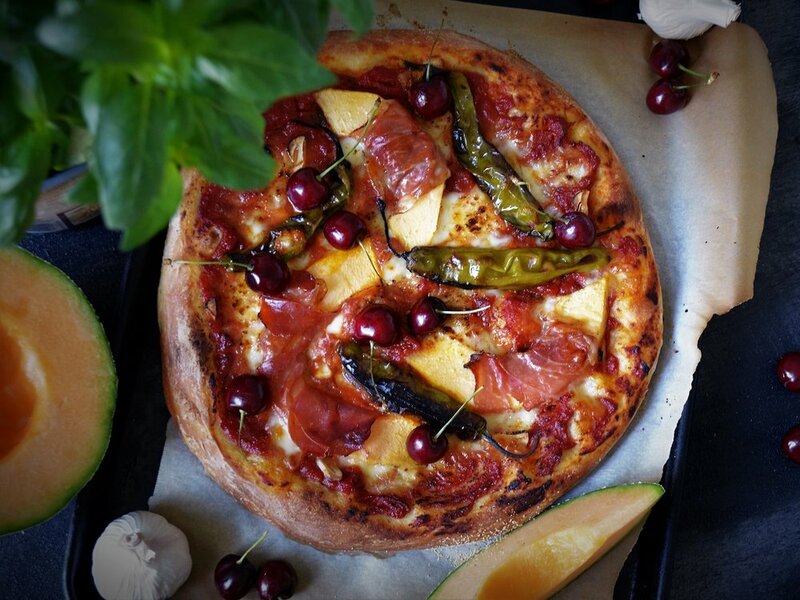 The cherries and peppers dominate the flavor profile of this pizza, mainly because the melon dries out in the oven and serve mainly as a crunch-factor. I think next time I'd put the prosciutto-wrapped melon on the pizza after baking and then torching the prosciutto so that the melon doesn't dry out, so that's how I'm going to write this recipe. It would introduce every flavor type there is: sweetness from the melon and cherries, bitterness from the scorched peppers, saltiness from the prosciutto and cheese, sourness from the sauce, and umami weirdness from the garlic soy glaze. What? There is garlic soy glaze? Read the recipe for details! 1. Mix the flour, yeast, and salt together. Add the oil and water. Mix with fingers until well combined. 2. Knead the dough for 3 minutes. Let rest, uncovered, 15 minutes. Knead for another 3 minutes. Cover with a damp towel. Let rest 4-6 hours at room temperature, or overnight in the refrigerator. 3. Preheat a grill/oven to the highest possible temperature. If using a baking steel, place it inside the grill/oven at this time. 4. Place a sheet of parchment paper on the pizza peel (or the counter if not using a peel). 5. Sprinkle the parchment paper with cornmeal, generously. 6. Stretch the dough into desired shape and lay it on the parchment paper. 7. Cover the surface with the sauce and Mozzarella. 8. In a skillet over medium heat, stir the garlic and peppers until fragrant. Remove the contents from the pan. Add the soy sauce and sugar to the pan and reduce about 1 minute. Add the garlic and peppers pack into the pan and coat. Continue cooking until the peppers are thickly coated. Place the peppers on the pizza. 9. Transfer the parchment paper to the preheated grill/oven. Close the grill, if applicable. 10. Cook for 10 minutes before checking the doneness of the bottom of the dough. Cook additional 1 minute at a time before checking the doneness again. Repeat until the bottom is fully cooked and nicely browned. NOTE: If the peppers begin to burn, flip them over and continue cooking. 11. If desired, transfer (without the parchment paper) to the broiler and cook an additional 2 minutes until the top is slightly burnt. Remove the pizza from the oven/grill. 12. Wrap one prosciutto slice around each melon round. Insert a skewer into each piece of melon. Using a kitchen torch, super-heat the prosciutto until it is nicely crisped on all sides. Place the melon rounds around the pizza. Scatter with cherries and Parmesan.